The DRF-IDC and the DRF-IAC current signal conditioners accept dc and ac currents respectively and provide an isolated 0 to 10 Vdc or 4 to 20 mA output. Models are available with three different power options, 24 Vdc, 120 Vac and 240 Vac. 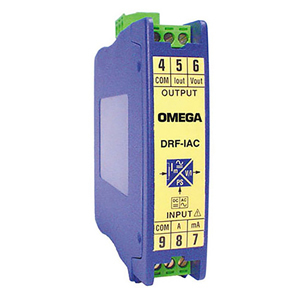 The DRF-IDC and DRF-IAC are ideally suited for industrial applications. All models mount on a standard 35 mm DIN rail and provide galvanic isolation between input, output and power up to 3500 Veff (model specific).